When Theodore Finch climbed the school bell tower the last thing he expected was to see someone else there thinking about ending their life. But there she was, Violet Markey. At first he’s confused as to why such a beautiful, popular girl would be there but then he helps her back safety. Soon they are spotted and Finch takes it on himself to tell everyone that she saved him, not the other way around and people instantly believe it, especially the classmates that referred to him as ‘freak’. Finch starts to watch Violet, seeing through her fake smiles and when he discovers that her sister died in a car crash earlier in the year he understands her actions more than most. When the class is set a project to get to know the state of Indiana Finch leaps at the chance to work with Violet. At first she still thinks he’s weird but soon she starts to see the world through his eyes and for the first time in months she starts to enjoy her days. Her friends hate him, he changes his style all the time and there’s a million rumours about him but none of that matters because he’s helping her live her life again. What Violet doesn’t see is the darkness that Finch suffers from and battles with every day. While she rediscovers her life, he struggles to find to find peace in his own. I was wrong. Later it is made clear that depression is a continuing theme in his life and although I wouldn’t wish that on anyone (even a fictional anyone) this came as a relief as I would not have continued reading otherwise as it would have felt too unrealistic. I recommend avoiding investigating this novel too deeply as you may uncover spoilers that would minimise it’s impact. This novel is pitched at a teenage and young adult market but this doesn’t stop Jennifer Niven from writing a hard-hitting and evocative novel that doesn’t hold back. Violet and Finch are both fun and heart-warming characters that are easily relatable but it really is the last 50 pages of this book that make it something special. There is a ‘trend’ of including mental illness in novels, especially YA ones recently but All The Bright Places handles a sensitive issue with tact and style. Ultimately Niven has written a hugely enjoyable novel about an important and difficult issue and All The Bright Places deserves all the attention it’s currently receiving. 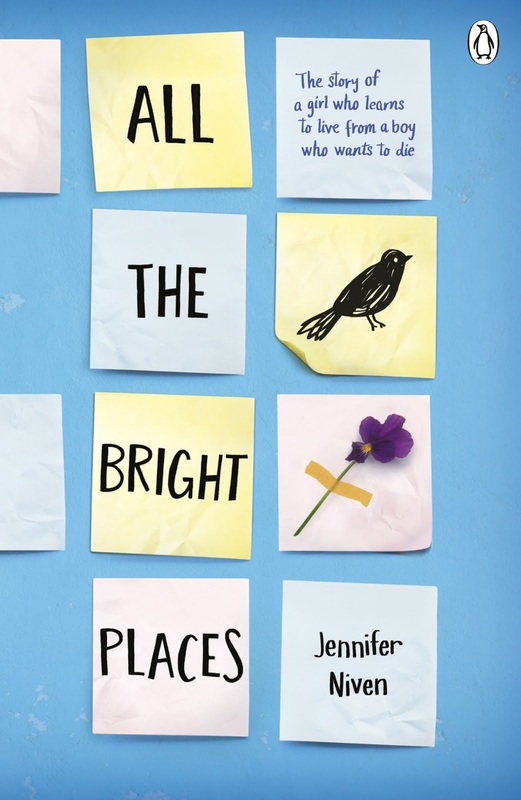 Buy your copy of All the Bright Places by Jennifer Niven from Amazon here.